Stetson University College of Law students Ethan Dunn, Christopher Hallett, Amara Benitez-Rodriquez, and Joseph Sise won the regional American Association for Justice Student Trial Competition on March 4 in Miami, and will advance to the National Finals Competition in April. 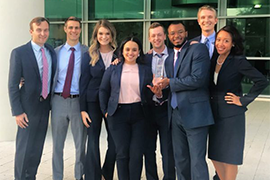 (L-R): Dalton Allen, Zach Morrison, Jessica Viola, Amara Benitez-Rodriquez, Ethan Dunn, Christopher Hallett, Joseph Sise and Ashleigh Thornton were among the students who competed in Miami. Only the top team from each region advances to the National Finals. Teams are judged on their case preparation, opening statements, use of facts, examination of lay and expert witnesses, closing arguments and professionalism. It is the second year in a row that Stetson has won the regional competition. The Stetson team was coached by Associate Director of the Center for Excellence in Advocacy and Professor Erika McArdle J.D. ’12 and Patrick McArdle J.D. ’12, partner with Grossman, Roth and Partridge. Stetson sent two teams to the regional competition, and of the 16 teams competing, only four teams, including two Stetson teams, advanced to the semifinals. A second Stetson team of Dalton Allen, Zach Morrison, Ashleigh Thornton and Jessica Viola advanced the semifinals. To learn more about advocacy at Stetson, visit www.stetson.edu/advocacy.